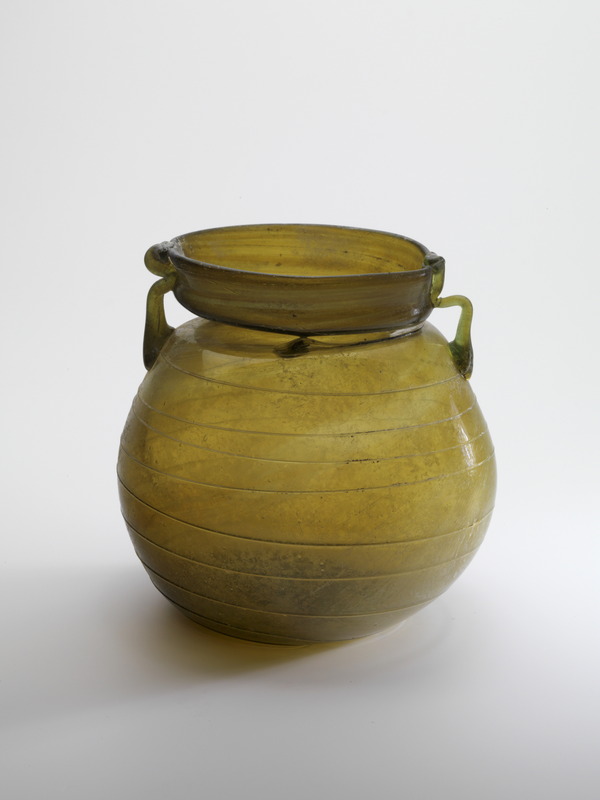 Description: Transparent greenish yellow glass, globular body, everted rim with beginning of a collar, slightly indented base with rest of pontil. Body decorated with a thread of thin glass, spiraling counterclockwise from top of the body with a drop of glass just below rim, to the base with approximately eight revolutions. Two small handles, applied on top of shoulder, drawn up and attached to vertical side of rim. Late 1st – early 2nd century AD. H= 14.5 cm. D max= 5.3 cm. D rim= 5.3 cm. Weight 133 gr. Classification: Isings 1957: Form 73a. Condition: Intact. Minute stress crack (1 cm) and tiny chips at rim. Some weathering. Technique: Mold blown body, tooled. Applied horns. 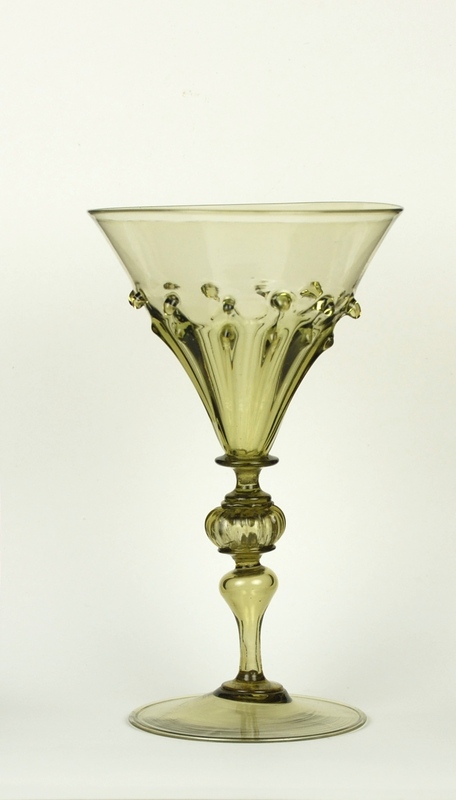 Description: Transparent yellowish-green glass. 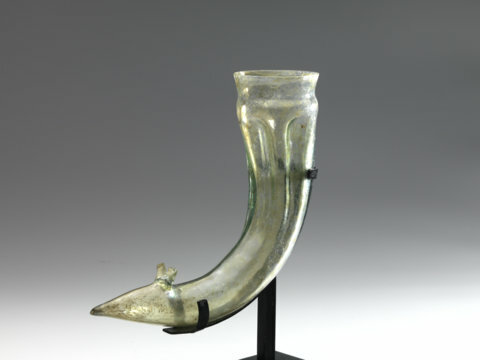 Drinking horn (rhyton) partly blown in mold with six vertical elongated indentations. Free blown short concave mouth with splayed cracked off, unworked rim. Wall descending into 90 degrees angle, tapering towards terminal in the form of a snail head. Elongated, pointed snout, open at the tip to allow liquid to be poured into the drinker’s mouth. Two prominent horns with tooling marks applied. Remarks: The height was measured vertically when rhyton stands on its rim. Longitudinal length over the convex side 27.5 cm. Glass snail rhyta are imitations of metal and earthenware types and are rare. The glass snail rhyta without foot are rarer than the footed examples. It is known from Roman frescoes that a banqueter drinks a liquid (wine?) from such a rhyton. Rhyta were also used to pour libations. Published: Pierre Bergé 26 May 2011, No. 354. Bonomi 1996, National Archaeological Museum of Adria, No. 449. Calvi 1968, Aquileia Museum, Tavola 19.1. Whitehouse 1997, Corning Museum, No. 186. Pierre Bergé 5 December 2010, No. 267. This tumbler is a golden honey color with thin white trailing. This piece is unusual because of its color, type of trailing and its small size. A glass pocket tumbler was carried by a traveler in a pouch or pocket and used for drinking. A large number of pocket tumblers were made in Spain from the early-17th though the late-18th century. The origin of the piece could be Spain, or Germany. No parallels could be found. A series of mold-blown sprinkler flasks having a closed off dropper mouth were created during the Third and Fourth Centuries. Such vessels exhibit a similarity in shape with a few variations in design. The swirled ribbing of this piece is typical, but the treatment of the mouth is not. Here the more common funnel-mouth is replaced with a tooled collar, suggesting a later date of manufacture into the Fourth Century. This two-handled globular flask was used for carrying oil to the public baths during the first centuries of the Roman Empire. Many of the remaining examples still have the bronze rings or chains attached to the handles. This example is not typical of the more common heavy aryballoi, but is thinly blown and has a delicacy which is enhanced by its fine proportions and silvery weathering. 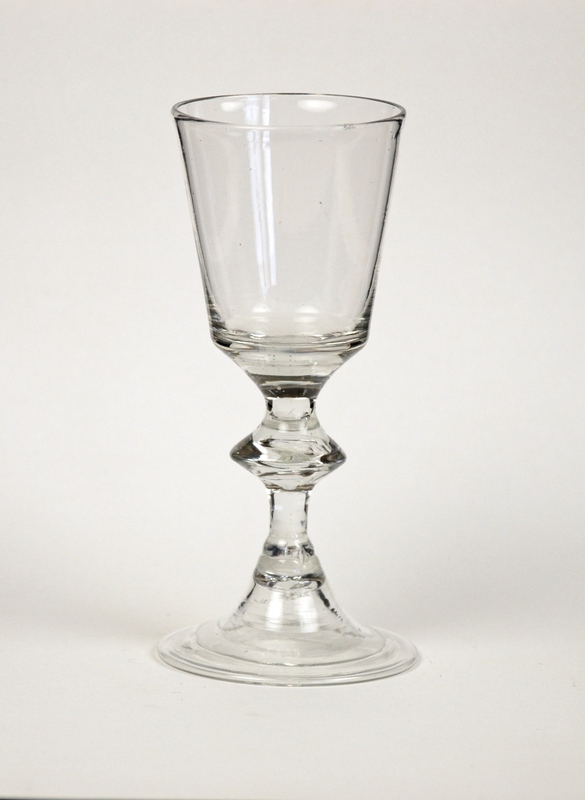 This French wine glass has a bucket bowl, stem with large bladed knop and high folded foot. 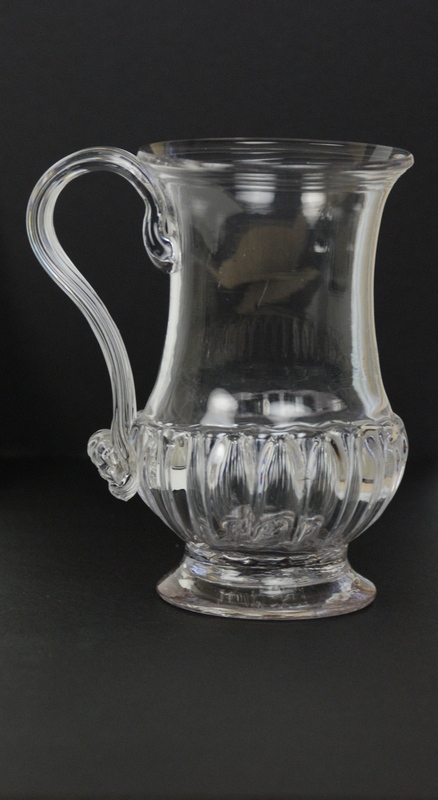 This English drinking vessel has a band of four threads below the rim, gadrooned base and single-loop handle.